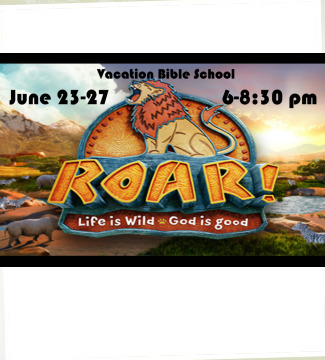 Harvest Hill's version of Vacation Bible School, called "Roar: Life is Wild. God is good," will be held June 23-27 (Sunday through Thursday) at our church building at 101 E. Evergreen in Strafford. The event will run from 6pm-8:30pm nightly. This is a FREE five-day event for children who have completed one year of preschool through 5th grade (including those who have just completed 5th grade in the Spring of 2019). There will be Bible lessons, games, music, food, crafts, skits and a ton of fun! Check back for more information, and be sure to check your "Around the Hill" newsletter! Don't get the newsletter? Sign up here!